The community is encouraged to come cheer on athletes as Emory hosts Special Olympics Georgia's 2017 State Summer Games this weekend, with opening ceremonies set for 7:30 p.m. Friday, May 19, on McDonough Field. Photo courtesy of Special Olympics Georgia. In addition to hosting special events, Emory offers a wide variety of summer sports camps and learning programs for children and teens. For more information, visit the WorkLife Resource Center's Summer Programs webpage. Even as Emory’s Class of 2017 was gathering for Commencement exercises last week, a fresh crop of scholars and visitors was preparing to arrive on campus, ushering in the university’s busy summer season. Summer brings a wide assortment of activities and events to the Emory campus, from thousands of young athletes and their supporters due here this weekend for Special Olympics Georgia's 2017 State Summer Games to a robust lineup of camps, conferences, classes and academic institutes. Traditionally, that means a steady stream of campus visitors representing a broad range of ages and interests, says Sherry Ebrahimi, director of Emory conference services and housing operations. Coordinated through the conference services division of Campus Life, the summer events pair campus spaces with offerings that complement the university’s mission. They also provide a source of both revenue and summer employment with programs that allow Emory to showcase the campus and its many resources — a natural recruitment opportunity for bright, prospective students, Ebrahimi says. This year’s summer schedule is expected to attract thousands of visitors to campus, who will engage in classrooms and playing fields while filling residence halls and the new DUC-ling interim dining facility, she notes. Special Olympics State Summer Games, May 19-21: About 3,000 athletes, sponsors and guests — along with some 2,800 volunteers — will arrive this weekend for Special Olympics Georgia's 2017 State Summer Games. The Emory community is encouraged to turn out to cheer on athletes competing in aquatics, flag football, gymnastics, soccer, table tennis, track and field, distance running/walking and volleyball. 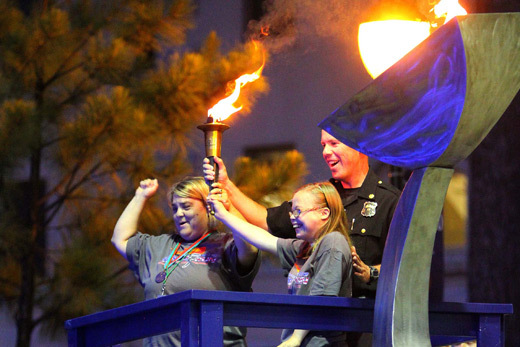 The Law Enforcement Torch Run opening ceremony will be at 7:30 p.m. Friday on McDonough Field; medals will be awarded throughout the weekend. The games are free and open to the public. EPiC Summer Experience, May 29-July 8: Offered through the Emory School of Medicine, the Emory Pipeline Collaborative (EPiC) science enrichment program offers 54 Atlanta public high schools students from economically disadvantaged backgrounds a hands-on opportunity to engage in lectures, labs and field experiences and explore career opportunities in health professions. The six-week program concludes with a closing ceremony July 8. UNCF/Mellon Summer Institute, June 1-30: The Mellon Foundation will host 30 African American undergraduate students interested in pursuing PhD programs to become college professors in the humanities, physics, mathematics, sociology, anthropology and other disciplines. Students will gather at Emory and other institutions as they sharpen their research, writing and presentation skills, with a focus on interdisciplinary research. Break Away: National Alternative Break Program, Alternative Break Citizenship School (ABCs), June 4-9: As a national alternative spring break umbrella organization for a network of over 200 member schools — including Emory — Break Away offers a resource to create meaningful volunteer and social advocacy opportunities for college students and recent graduates. Hosted in partnership with Emory, this year’s program will focus on immigration and citizenship. Emory National Debate Institute Summer Camps and Workshops, June 4-24: The Barkley Forum, Emory’s award-winning center for intercollegiate competitive debate and debate education, hosts a series of summer debate camps and workshops for middle school and high school students. Hundreds of students will work with Emory faculty and students to hone their skills. Youth About Business, June 4-9: A diverse group of high school students from the Atlanta area and Southeast are invited to learn about the world of high-level corporate finance through merger and acquisition simulation camps. Students are advised by Goizueta Business School faculty and staff, alumni, Atlanta-area attorneys, accountants, investment bankers and many other executives to understand these business transactions. NASPA Region III/SACSA Mid-Manager’s Institute, June 11-16: Applicants are selected to attend this focused, unique professional development experience presented by a partnership between the Southern Association for College Student Affairs (SACSA) and the National Association of Student Personnel Administrators (NASPA) Region III to enhance and develop skills and relationships. Youth Theological Initiative (YTI), June 11-15, July 2-22: High school youth from around the country will participate in two sections of programs: a three-week Summer Academy of the Youth Theological Initiative and the five-day Taste of YTI: Finding God in the City designed to explore theological questions in a supportive community. Sponsored by Candler School of Theology. Summer Bassoon Extravaganza, June 25-July 1: A one-of-a-kind experience for bassoonists, the Summer Bassoon Extravaganza offers aspiring bassoonists (rising eighth-graders through college) access to nationally recognized faculty and guest artists. The week-long camp features master classes, chamber ensembles and a bassoon choir, along with special-interest classes. The camp concludes with a concert featuring small ensembles and the bassoon choir. Southern Foodways Alliance Oral History Workshop, July 16-22: Based at the University of Mississippi’s Center for the Study of Southern Culture, the Southern Foodways Alliance will host undergraduate and graduate students and other professionals on the Emory campus as they learn the fundamentals of taking and compiling oral histories, particularly as they relate to culture and food. SACAC Dry Run for College Admissions Counselors, July 23-26: The Southern Association for College Admission Counseling will host an annual workshop designed to provide practical experience for new college admissions professionals with the help of seasoned industry leaders.